"The classical fusion ... an intriguing blend of pure classical vocals and modern ambient textures ... " - Lisa Tsering, India West. The Ali Khan family represents a 500 year lineage of musicians of the Shamcharasi Gharana, descendants of two famed court musicians to the artistically-devoted Akbar the Great: Chand Khan and Suraj Khan. Chand Khan used to sing morning ragas to this most famous Indian ruler of the Moghul Age of the India empire. Now Salamat a legendary vocalist throughout the Indian subcontinent, is joined by his two sons for these ragas of blessings, invocations, romantic and sad moods. Michos plays guitars, synthesizers, percussion and samples, with additional Santur, violin, piano, wind chimes, harmonium, and even Stephen Kent on didgeridoo and Alan Kushan on Santur. Ustad Salamat Ali Khan (Born in 1934 in the Hoshiarpur district of Punjab), father of an entire family of vocalist-musicians, performed (at the age of nine), with his brother Nazakat Ali Khan, as the famed Ali Brothers. They were internationally renowned as superstars in the 60's and 70's for their immense talent and artistry in the classical form. Now the next generation is becoming increasingly recognized for their great talents. The children are Sharafat Ali Khan, Shafqat Ali Khan, Sukhawat Ali Khan and Riffat Salamat. 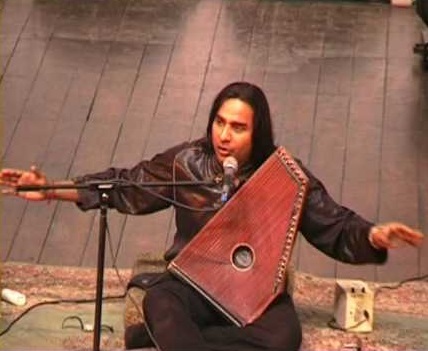 Shafqat Ali Khan (Born June 17, 1972 Lahore Pakistan) belongs to the Sham Churasi school from East Punjab. This school of music has a long tradition that dates to the Mughul times of Emperor Akbar. This school was established by the two brothers Chand Khan and Suraj Khan. His uncle Ustad Nazakat Ali Khan and father Ustad Salamat Ali Khan, the internationally acclaimed classical singers, from the 10th generation of the Sham Churasi school. Shafqat began performing at the age of seven. His first performance was at the Lahore Music Festival in 1979. Shafqat has performed throughout Europe with several important concerts in France, the United Kingdom, Italy, Germany, Holland, Spain, and Switzerland Geneva Festival. He is a well established performer throughout India, Pakistan, and Bangla Desh. He has performed as well throughout Canada and the United States with some key performances at the Smithsonian Institute in the 1988 and 1996, and for the World Music Institute at the New York's Metropolitan Museum in 1988 and Merkin Concert Hall in 1991. Shafqat in the recipient of a number of awards, in 1986 in Lahore he received the Amir Khusro Award as the best young classical singer. In 1987, he received the Gold Medal from Faislabad University, Pakistan. In 1995 he received the Ghanda Award from New Deli University. He has appeared on recordings from Nimbus (UK), EMI (India), HMV (UK), Water Lily Acoustics (USA), Westron (India), Mega Sound (India), Keytune Productiona (Holland), Plus Music (India) (forthcoming), and Folk Heritage (Pakistan). Groomed by his father, the late Ustad Salamat Ali Khan, Sharafat Ali Khan was one of the leading representatives of the Shamchaurasi Gharana. He was Initiated into classical music at the age of seven by his illustrious father and used to accompany him along-with Shafqat Ali Khan. His debut performance was held at Pakistan Centre Al- Falah, Lahore in 1968 and he used to performed solo after the death of his father in the late 90's. 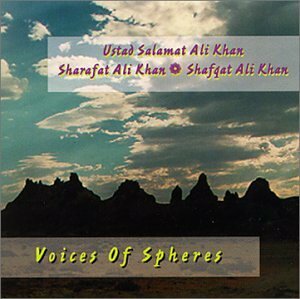 Ustad Sharafat Ali Khan was born in Lahore and died November 29, 2009. He toured extensively in USA, Canada, Europe, Australia, India, Afghanistan and Africa. Instrumentation: Vocals, Synthesizers, Processed Electric Guitars, Santur, Digeridoo, Keyboards, Tabla,Bass. Featuring "Alan Kushan - Santur" and "Stephen Kent -Digeridoo"
An "ambient" journey into the world of Indian Classical Music. Blended soundscapes, surround astonishing vocal performances of rare raga alaaps from one of the Indian subcontinent most revered musical families. Salamat Ali Khan, Shafqat Ali Khan & Sharafat Ali Khan combine talents with the support of the multi-talented instrumentalist and producer Richard Michos. Salamat a legendary vocalist throughout the Indian subcontinent, is joined by his two sons for these ragas of blessings, invocations, romantic and sad moods. Michos plays guitars, synthesizers, percussion and samples, with additional santur, violin, piano, wind chimes, harmonium, and even Stephen Kent on didgeridoo and Alan Kushan on santur. Co-producers: X DOT 25 and Konstantine Baranov.